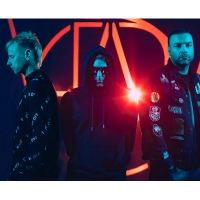 Globally-successful, award-winning UK alternative/ progressive band featuring Matthew Bellamy - vocals, guitar and keyboards, Chris Wolstenholme - bass and Dominic Howard - drums. Album releases include their 1999 debut "Showbiz", plus "Origin of Symmetry" (2001), "Absolution" (2003), "The Resistance" (2009), "The 2nd Law" (2012), "Drones" (2015) and 2018's: "Simulation Theory". Crowd-favourites include "Plug In Baby", "New Born", "Stockholm Syndrome", "Time is Running Out", "Hysteria" and "Knights of Cydonia".